Formerly 1623, Suffolk Cyclist Battalion. Relatives Notified & Address: Son of Mr & Mrs A.G. Bultitude, of ‘Braiseworth’, Garrison Lane, Felixstowe, Suffolk. 1901 3, Dogs Head Street, Ipswich. Arthur was 8 years old and living with parents. Arthur George Bultitude , 36, a Builder Ironmongery Merchant – employer – at home, born Colchester, Essex. Alice Bessie Bultitude (nee Manning), 35, born Mendham, Norfolk. 1911 31, Cromwell Street, Ipswich. Arthur was 18 years old, a Cycle Accessories – Traveller. He was living with his mother. In 1911, Arthur’s father was staying at 36, Alpha Road, Chesterton, Cambridgeshire, the home of 47 year old, Sarah Ann Presson & her family. Arthur, 47, a Cycle Agent – own account. 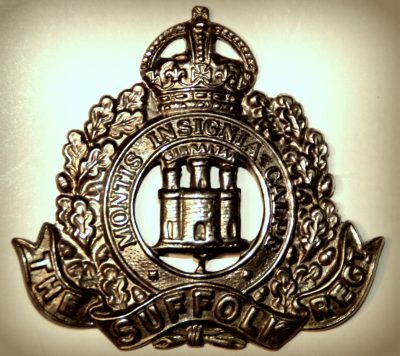 On the 11th October the Suffolk Regiment 7th Battalion, having been allotted its task in the Battle of Transloy (already in progress) received the orders to take part in an attack on “Bayonet Trench” and “Luisenhof farm”, which had been fixed for the 12th.Going in over-night , they were heavily shelled until they occupied their assembly trenches just before dawn. All the company headquarters were in a large dugout in the sunken road leading to Guedecourt wood. After passing a reasonably quiet forenoon the battalion set out across the open at 2pm coming immediately under a very heavy cross fire of every description, but mainly from machine guns and automatic rifles. Close to the German trenches the attack was held up by machinegun nests and wire, and waves, unable to get any further, lay down. At this juncture remarkable bravery was displayed by several officers, non-commissioned officer, and men. Luet. Eagle is reported to have died fighting in the German first line, into which he had forced an entrance alone. 2 nd Lieut. Marshall, in a shell-hole with his servant and a sergeant, was bombed and sniped all afternoon, and later killed. They were close up against the German wire, but refused to go back. Captain Isham, badly wounded during the afternoon, spent the night in a shell-hole, being visited by Lieut. Bowen (himself wounded), who remained with him till dark. The full story of this sad day, on which the 7th Battalion sustained over 500 casualties, has never been described in print. Let it suffice to say that all ranks, especially the reinforcements which recently arrived from the 6th Cyclist Battalion (becoming the 7th), acquitted themselves admirably. The failure of the attack was due in some measure to the facts that the enemy’s wire had been only partially destroyed, and that the barrage during the launching of the attack was ineffective. Before zero hour Captain Leith-Hay-Clarke had been twice buried by shells. Of the fourteen officers who went over the top on this occasion all became casualties. For his part in the action Rev. A.E Cousins, chaplain to the 7th Battalion received the Military Cross. Lieut. Bowen, wounded for the second time in three months was also awarded the Military Cross.